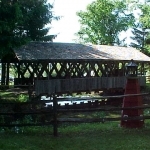 The Frontenac-North County Covered Bridge is the only covered bridge still standing in Jefferson County and is maintained by the owner and carries pedestrian traffic across a private pond. 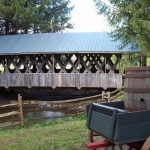 It is one of two (the other being the Eagle Mills Covered Bridge) covered bridges in the state with a double walkway. 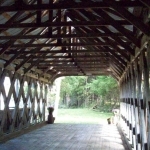 Built by C. Gary Beckstead in 1979, this 42-foot-long, single span structure incorporates the Town lattice truss design patented on January 28, 1820, and again in 1835 by Ithiel Town of New Haven, Connecticut. 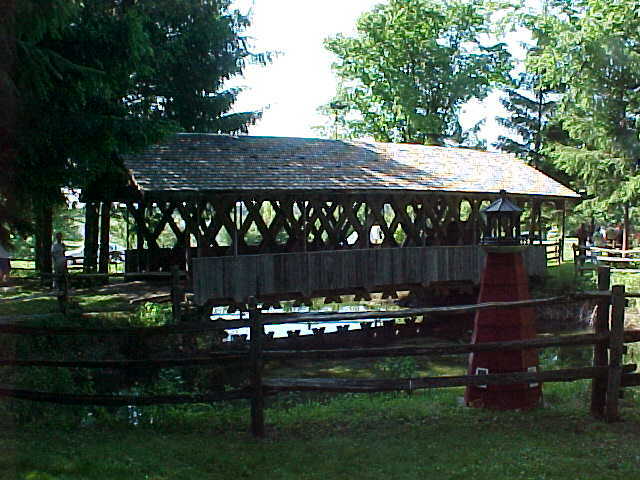 The Frontenac-North Country Covered Bridge received its name from a trail that went from the 1673 Fort Frontenac area to Fort Ontario in Oswego, NY. The 1673 Fort Frontenac later became Kingston, Ontario and the first capital of Canada. Frontenac was the first Governor General of New France, now Quebec Province. The French claimed this area as part of New France for many years. In 1814, this same trail was the route used to carry a 9,600-pound rope to be used in the rigging for the tall ships built in Sackets Harbor. The ships would have been useless without this rope to hang their sails. 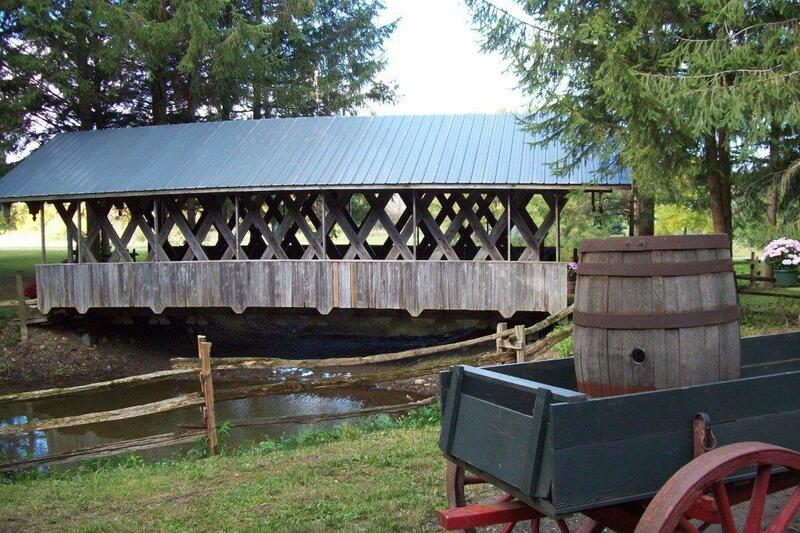 This famous event was part of the deciding factor that made this area part of New York State. Since that time, it has been known as the Cable Trail. 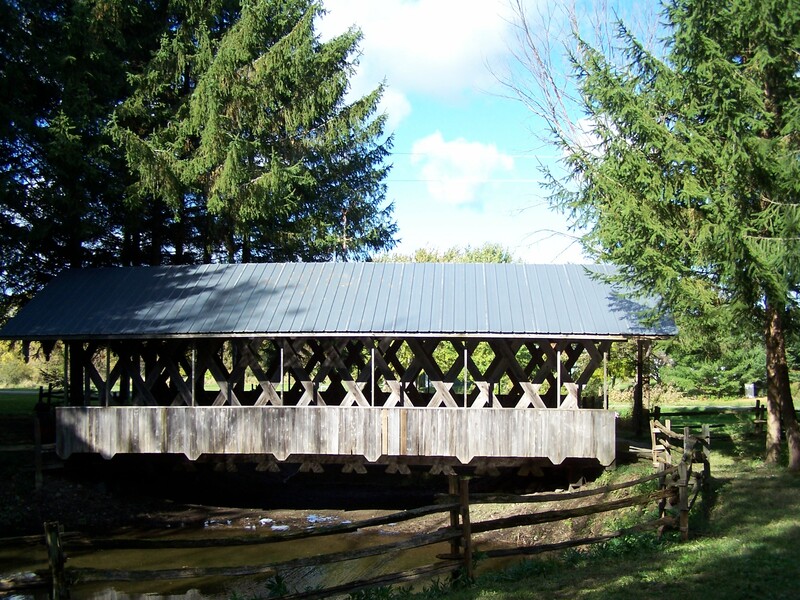 The bridge rests on the same path where these first American settlers once walked. 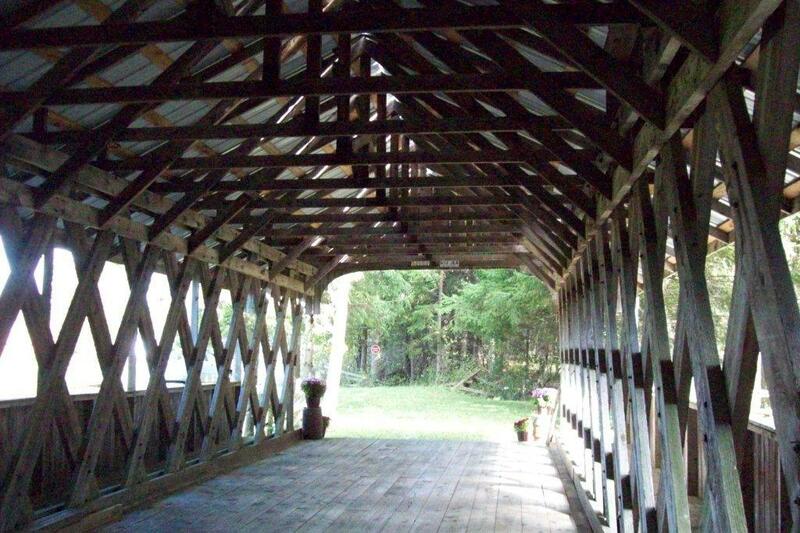 Several interesting events have occurred at the Frontenac-North Country Covered Bridge over the years. In 1986, a sports car traveling over 100 mph went off the road and after rolling over several times, taking out four trees in the process (some over 30-foot-high), landed in the pond pinning the driver under the car. The passenger in the vehicle quickly pulled the driver to safety; fortunately, the driver sustained only minor scratches to one hand. The owner had received the car as a graduation gift and had only had it one day. 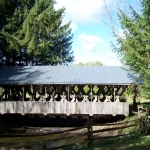 In the early 1990s, a young lady from the state of New Mexico, whose parents had divorced many years ago, came to Adams, NY looking for her father. 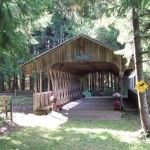 During her quest, she discovered this bridge and liked it so much she decided she would like to be married there someday. She fulfilled her wish a year later. 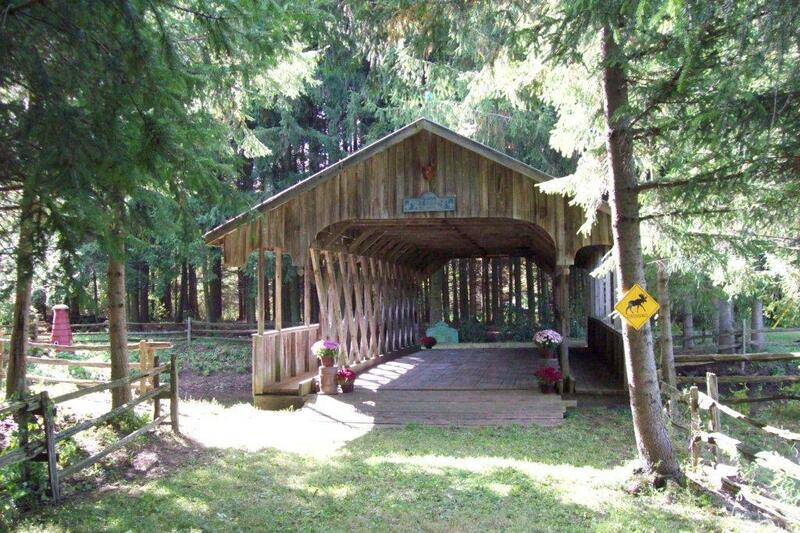 Subsequently, there have been several weddings on this bridge. 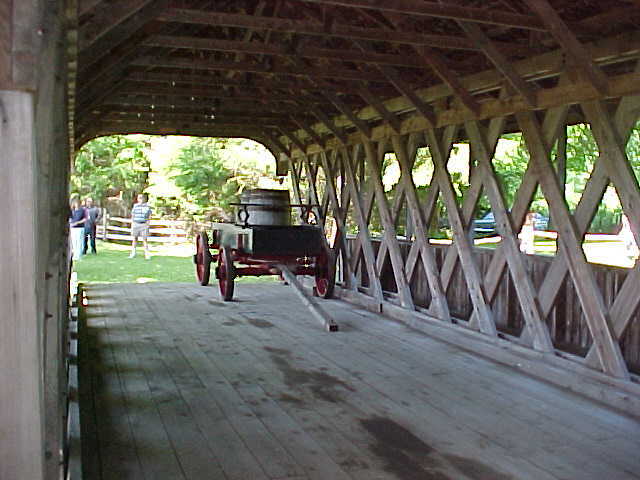 In 2005, this bridge was visited by the President of the Model T Club from Dearborn, Michigan. He drove his personal 1915 Model T Ford 1,100 miles, one way, under its own power on a trip throughout upstate New York. 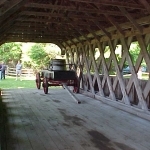 He also repairs other Model T’s that run throughout the streets in Greenfield Village at the Henry Ford Museum. 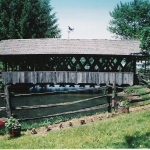 The Frontenac-North Country Covered Bridge has hosted the New York State Covered Bridge Society meetings on several occasions with people attending from various states. It has also been the backdrop for WWNY Channel 7 News out of Watertown, NY. 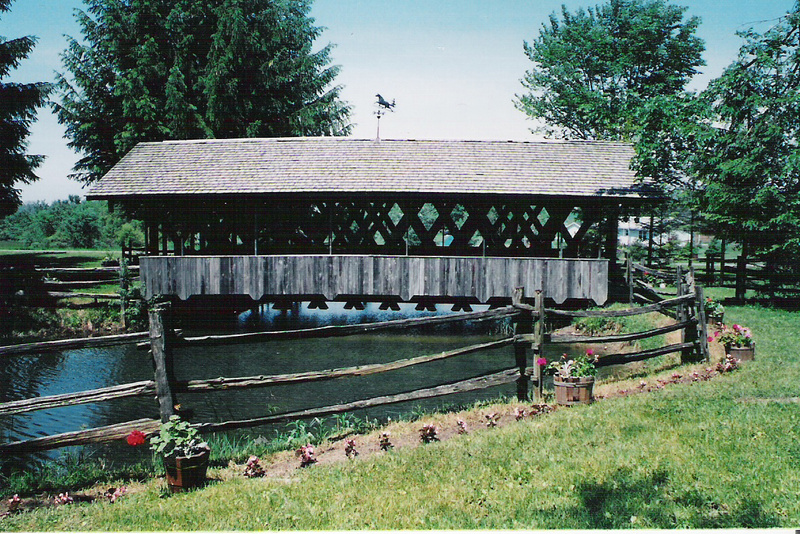 Written by bridge owner C. Gary Beckstead, Adams, NY.